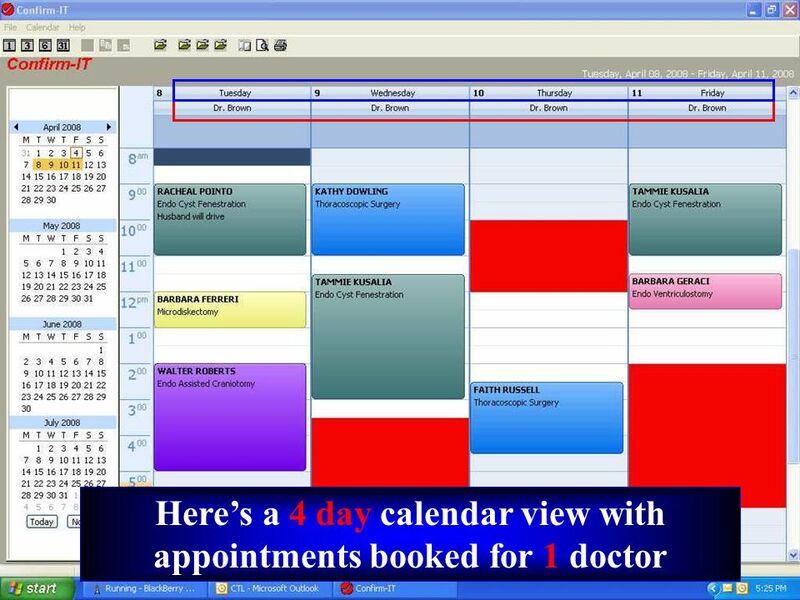 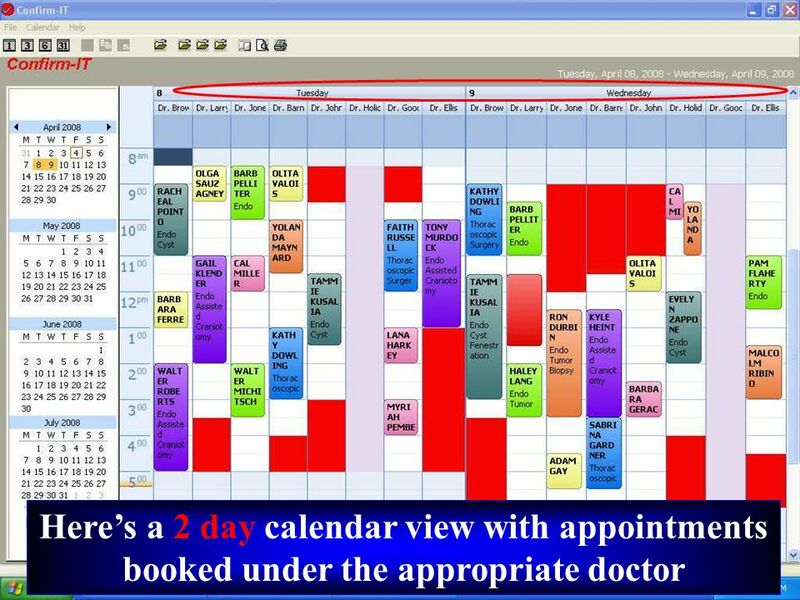 MEDICAL CARE An advanced, powerful appointment booking & confirmation tool …….designed specifically for the Medical Community. 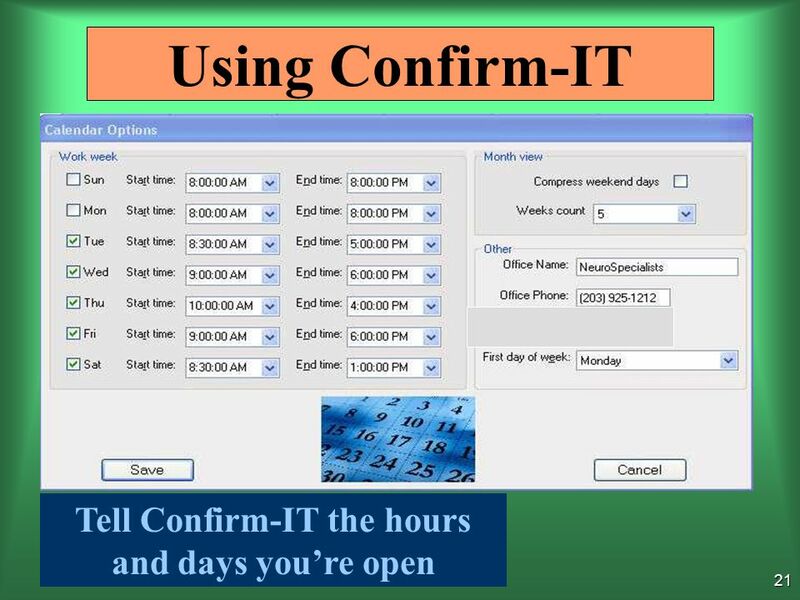 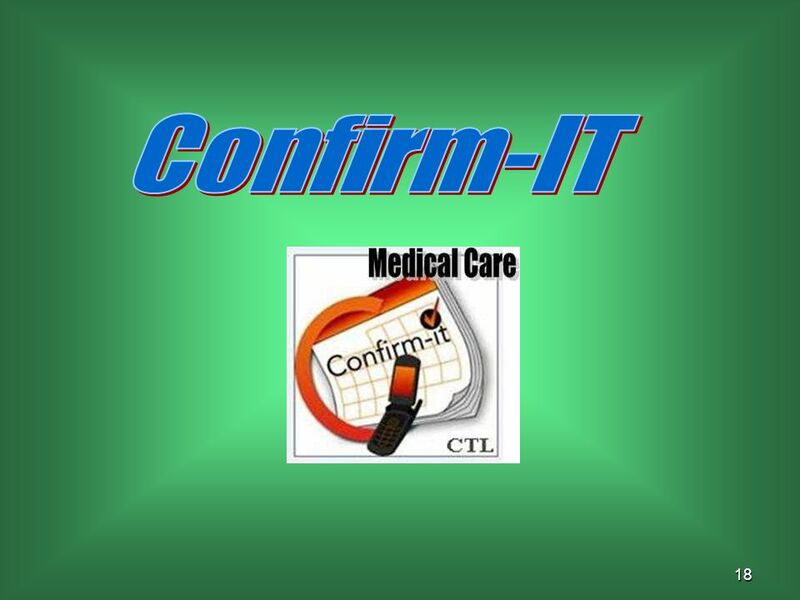 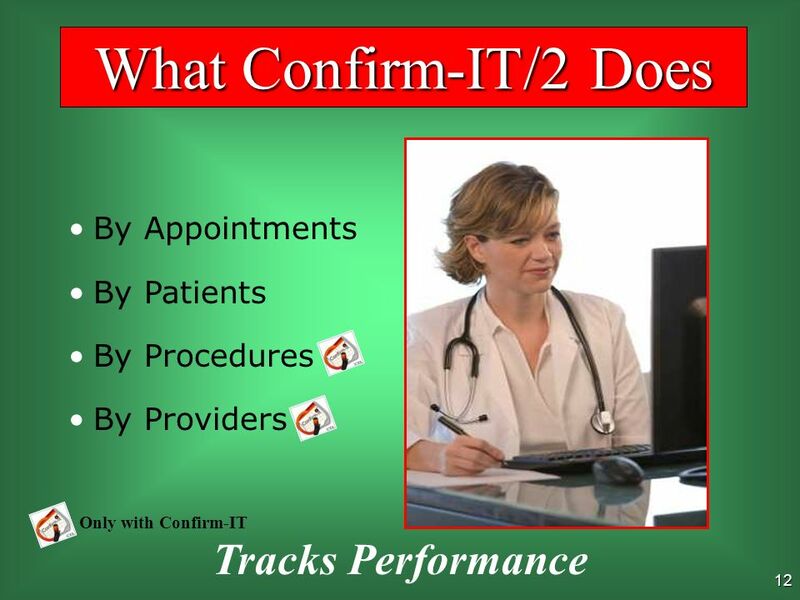 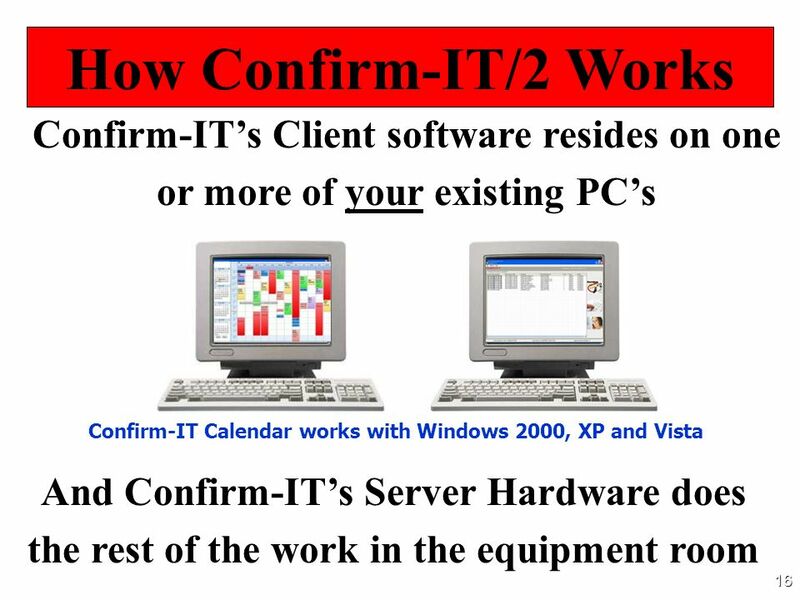 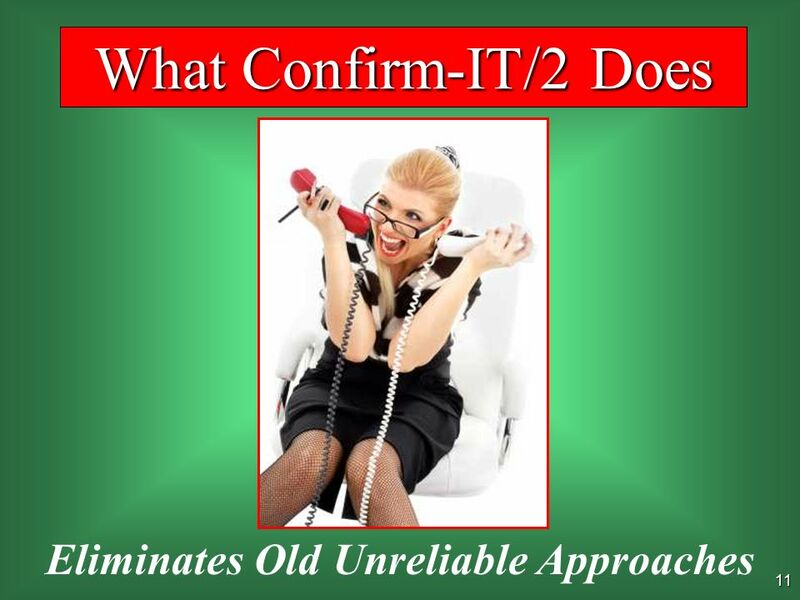 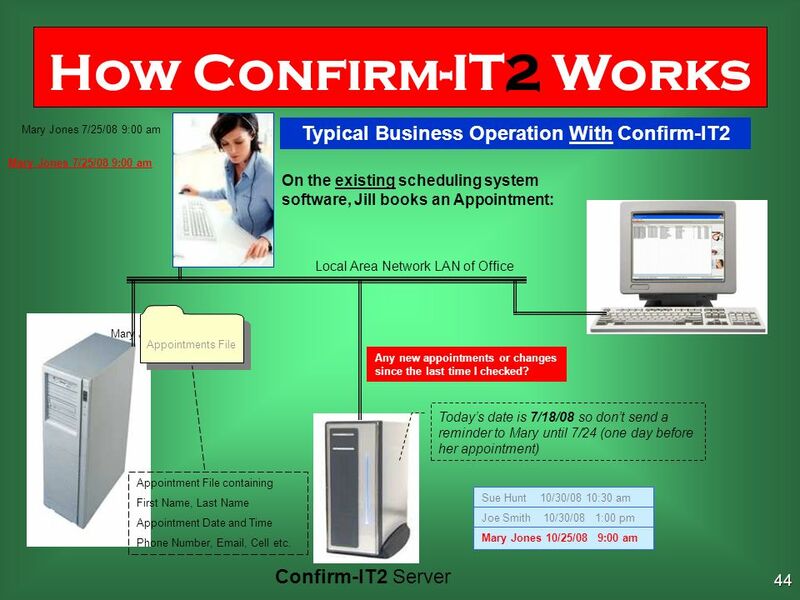 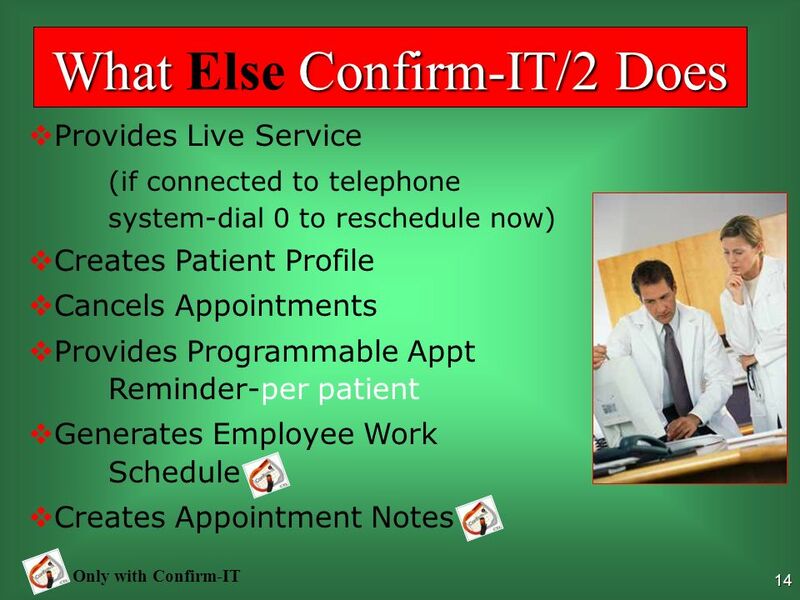 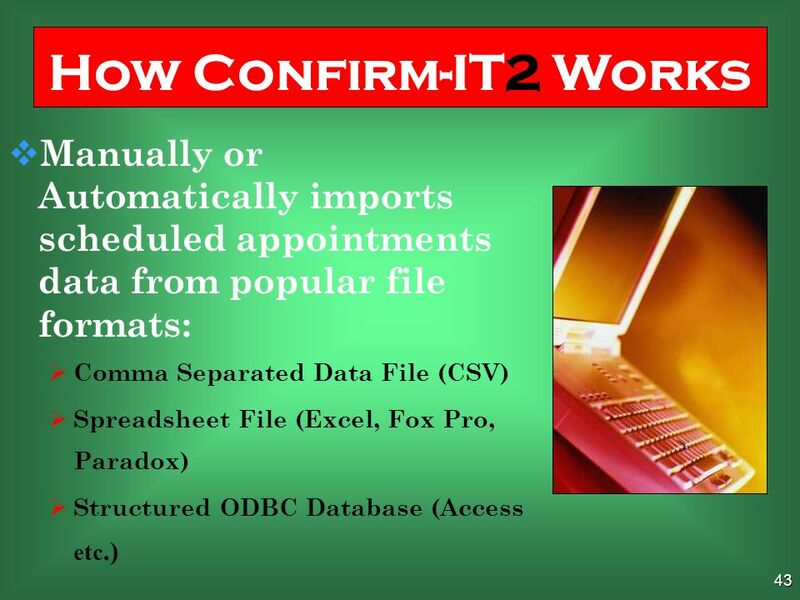 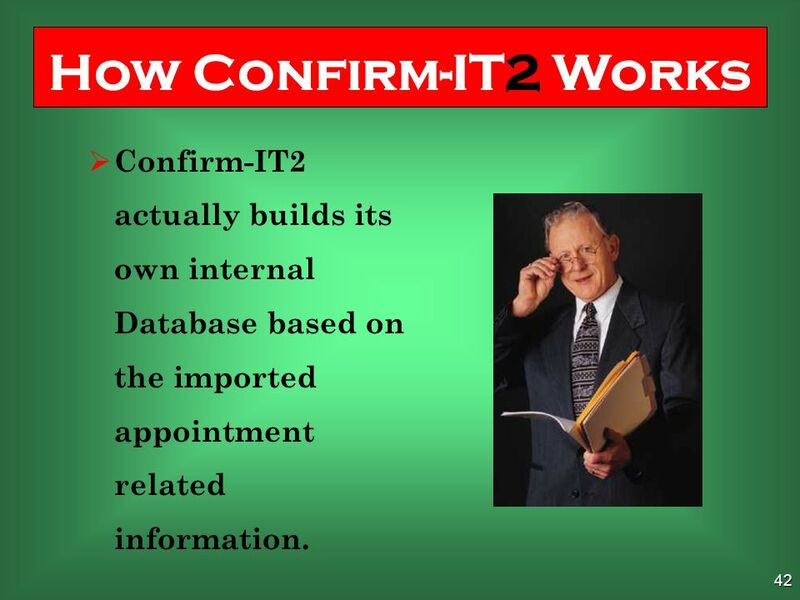 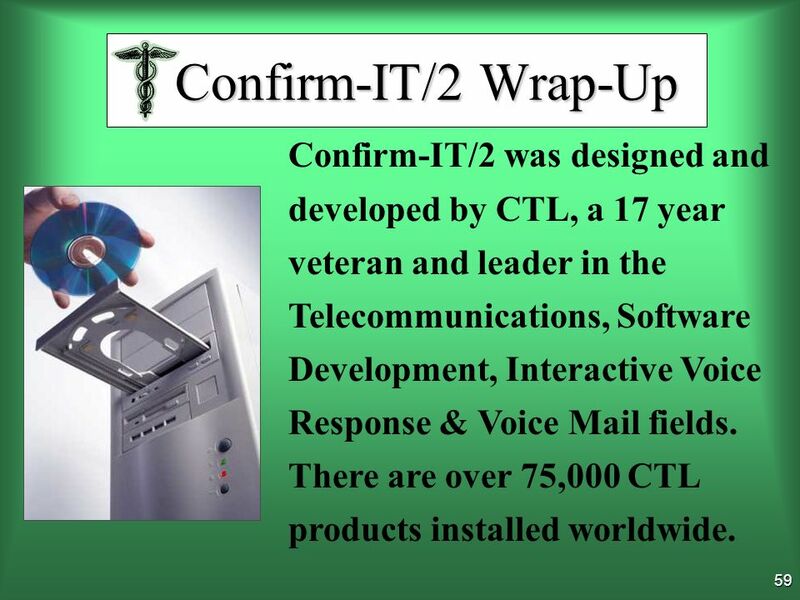 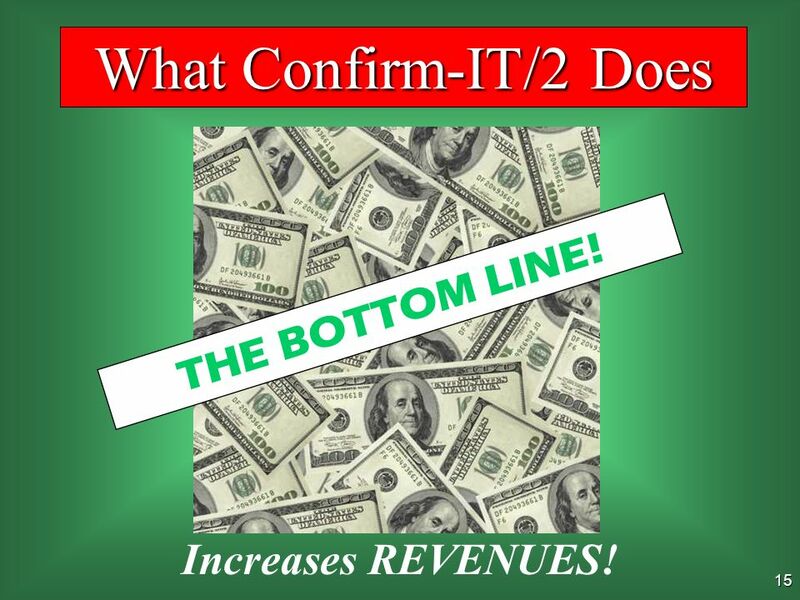 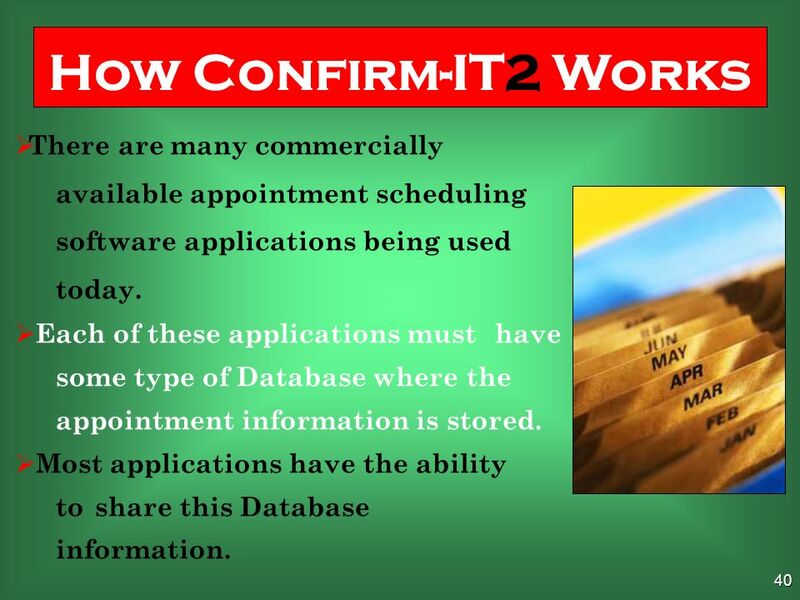 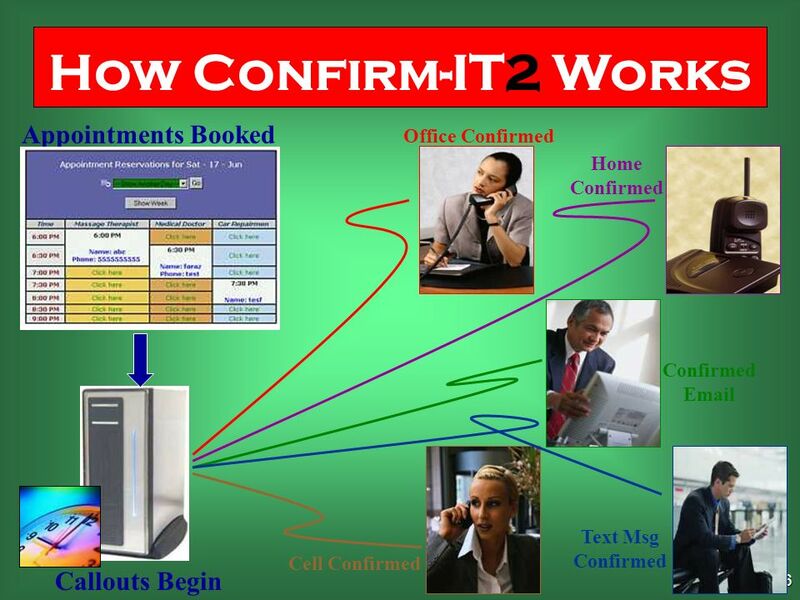 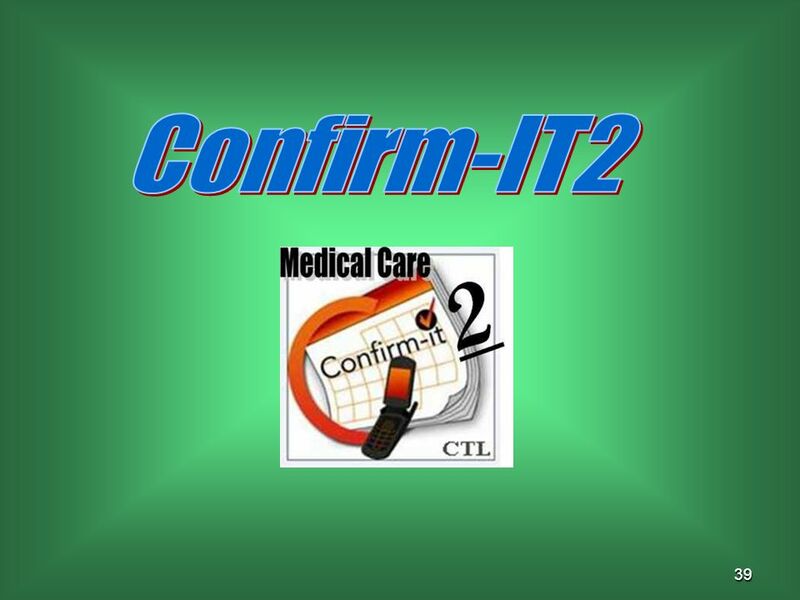 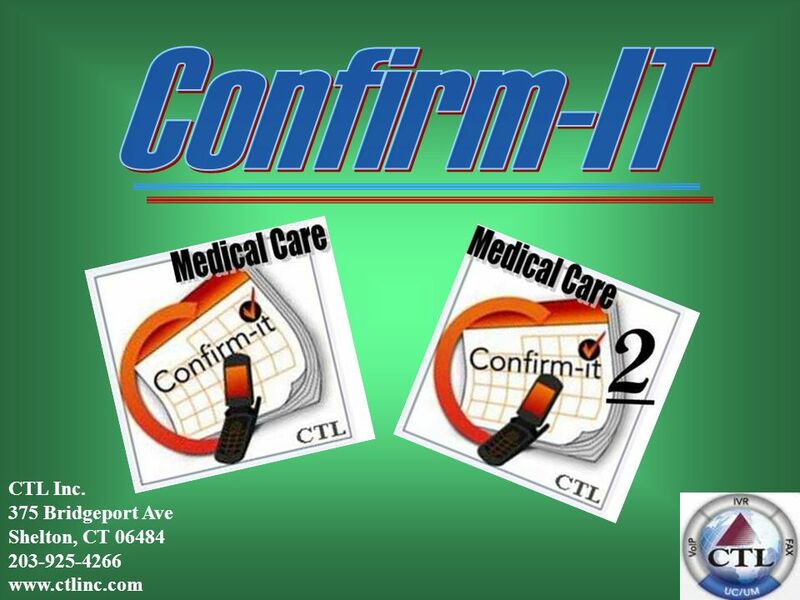 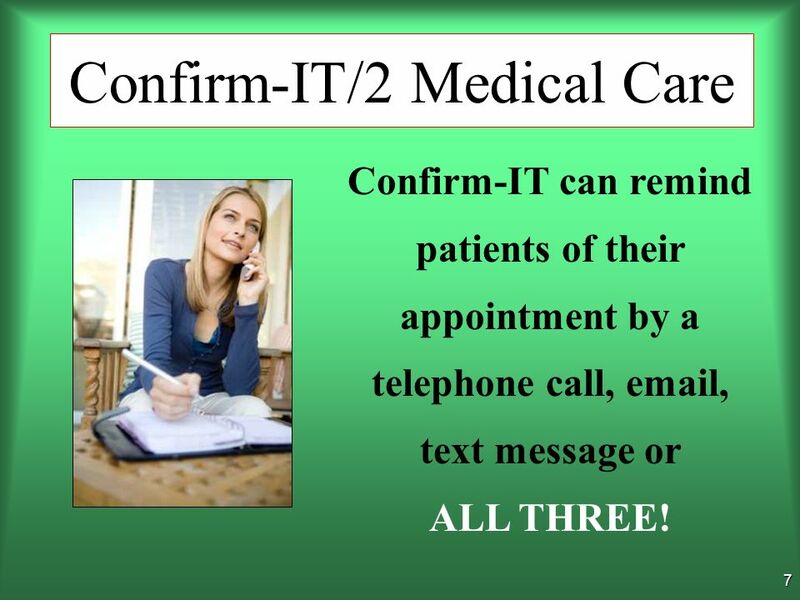 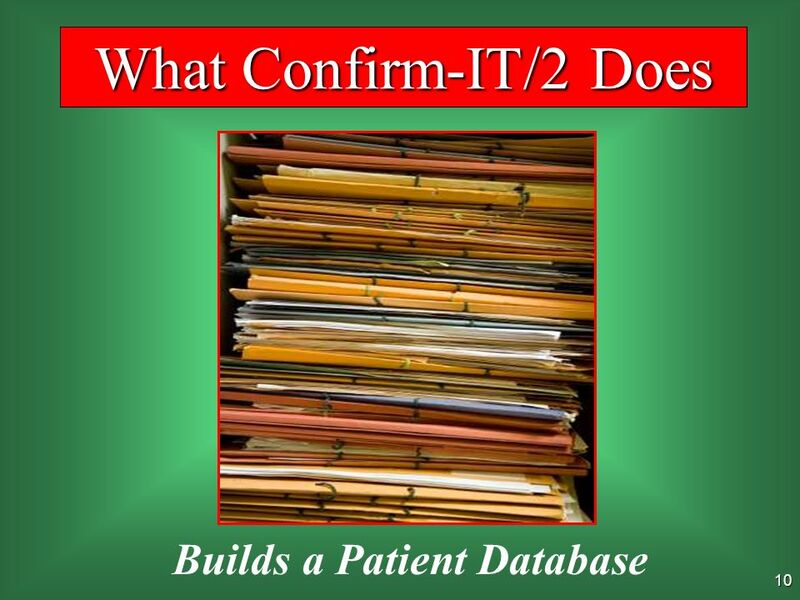 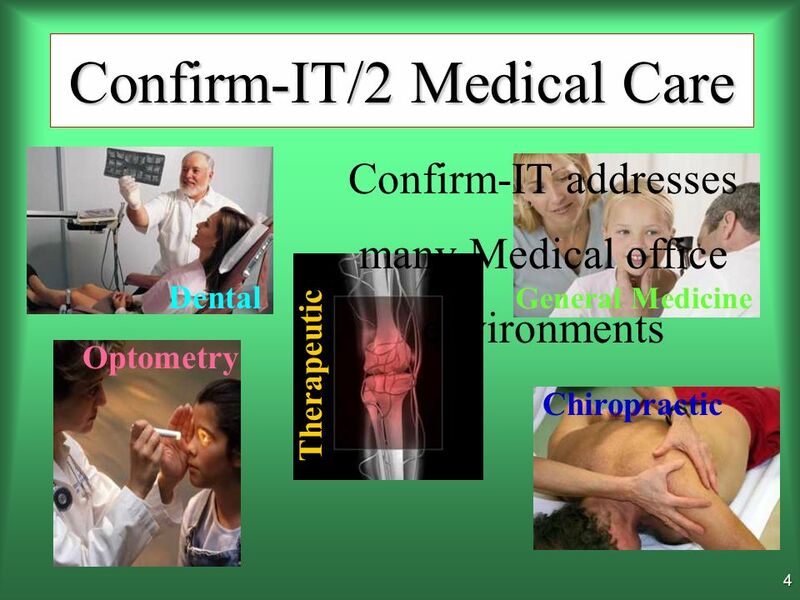 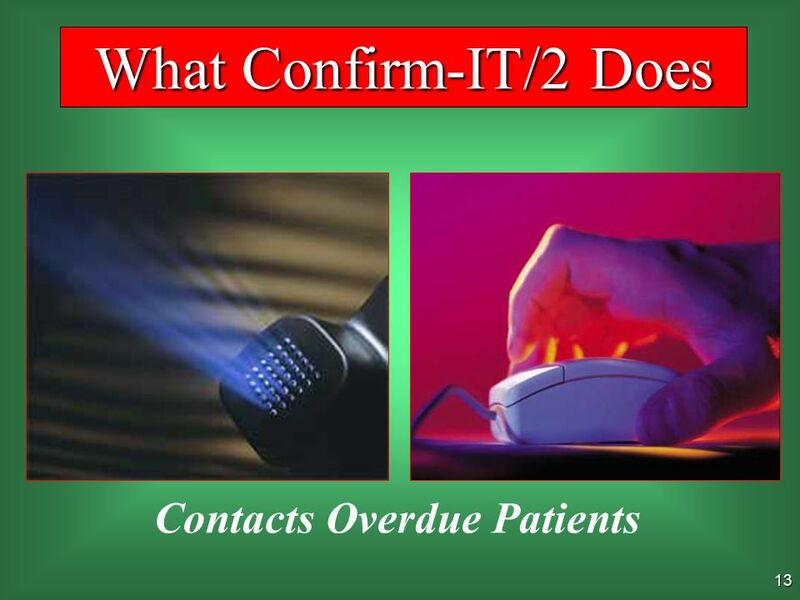 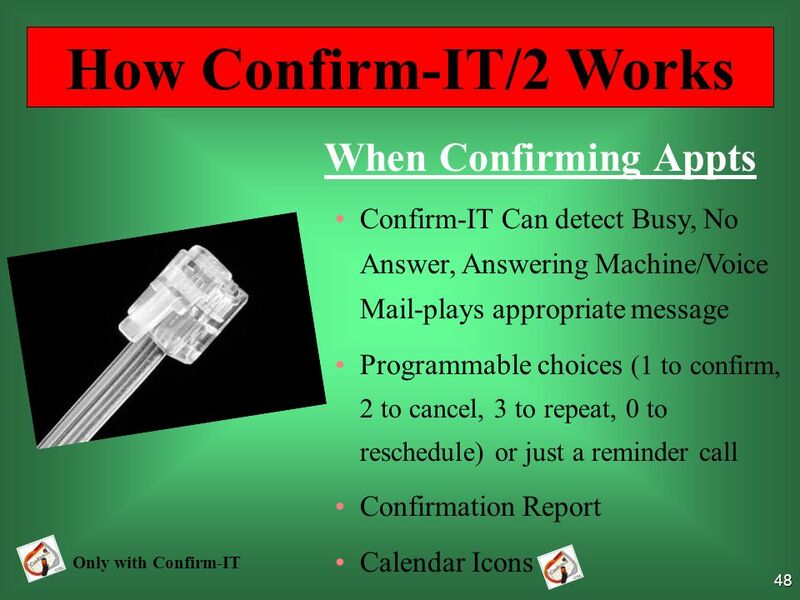 3 2 CONFIRM-IT and CONFIRM-IT2 are advanced appointment confirmation products designed for small to medium businesses. 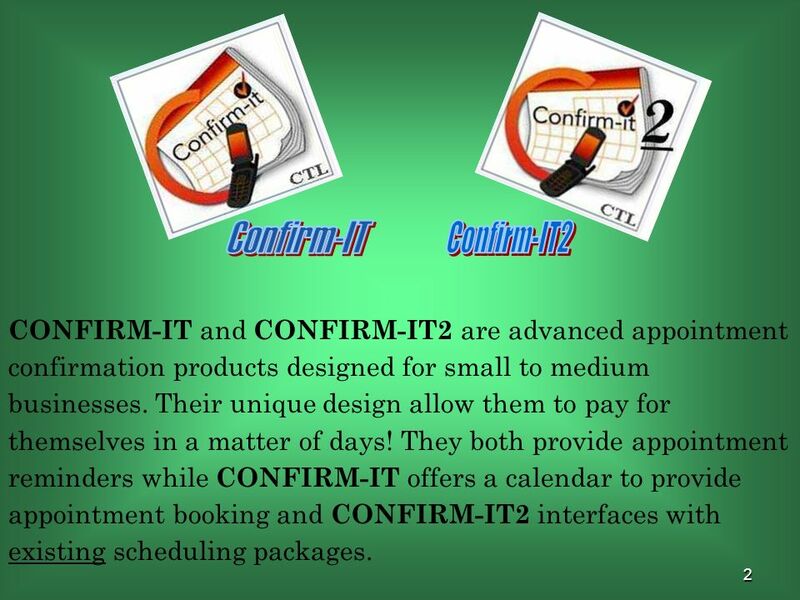 Their unique design allow them to pay for themselves in a matter of days! 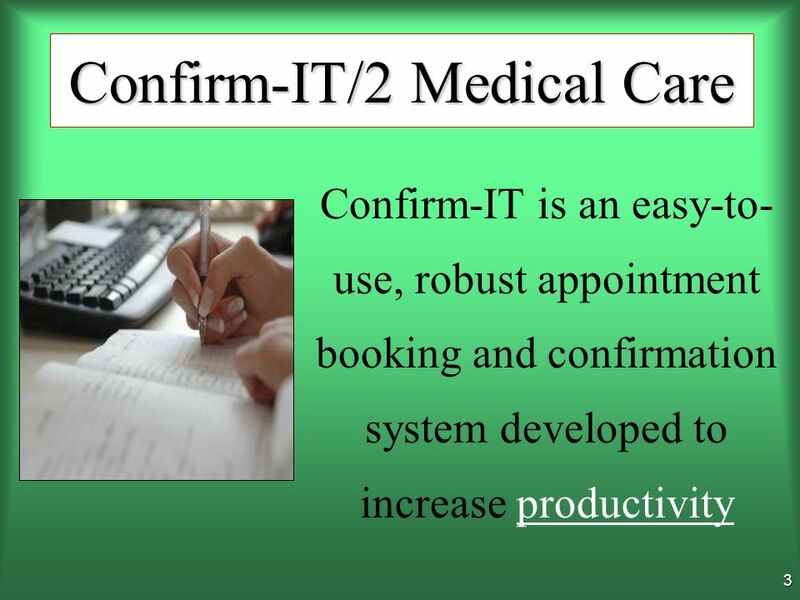 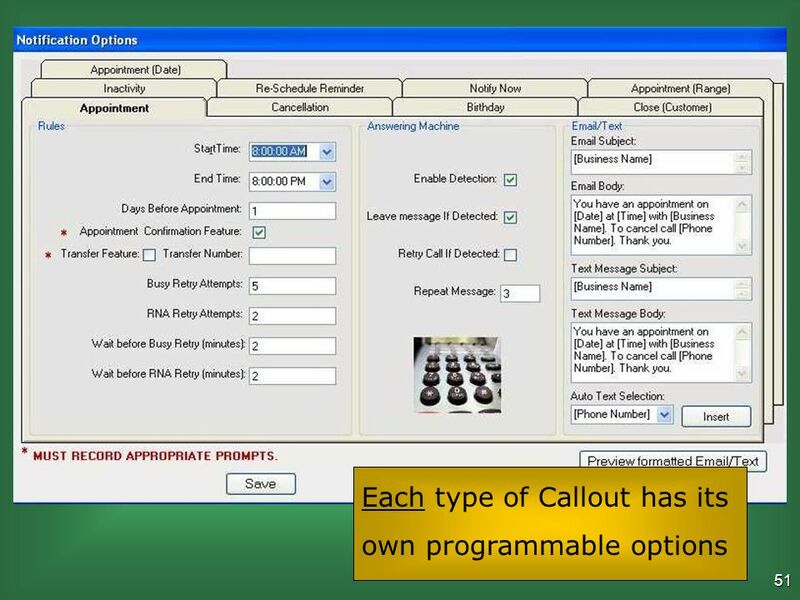 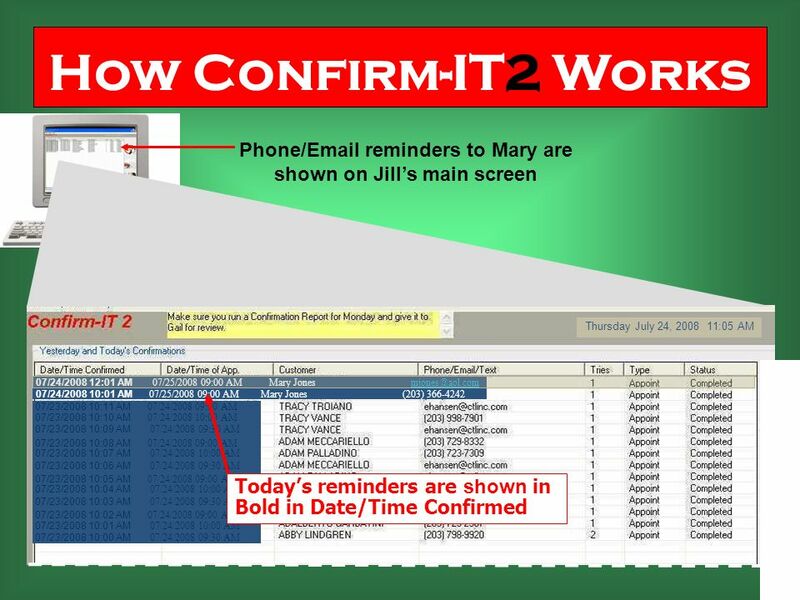 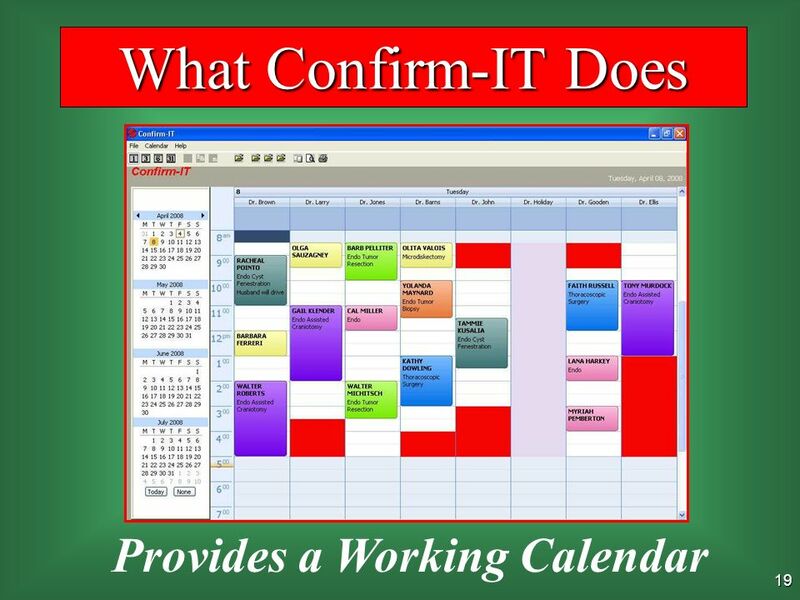 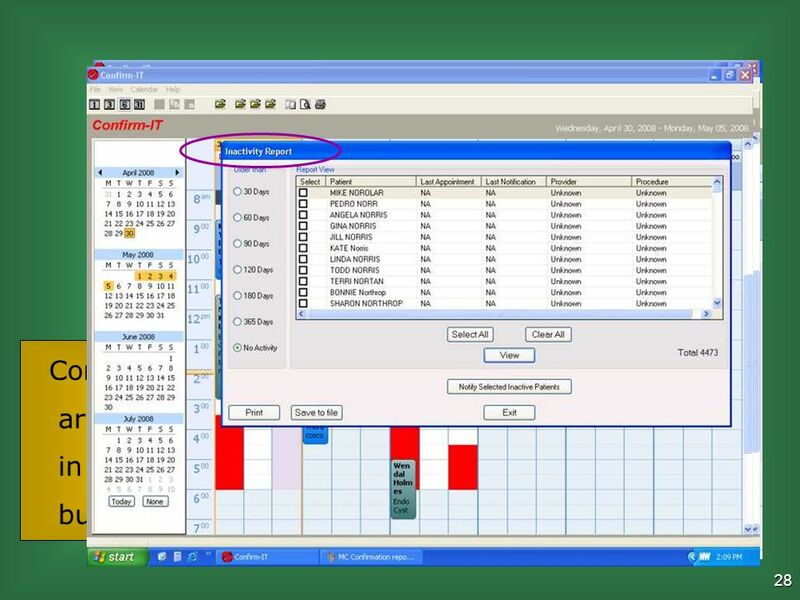 They both provide appointment reminders while CONFIRM-IT offers a calendar to provide appointment booking and CONFIRM-IT2 interfaces with existing scheduling packages. 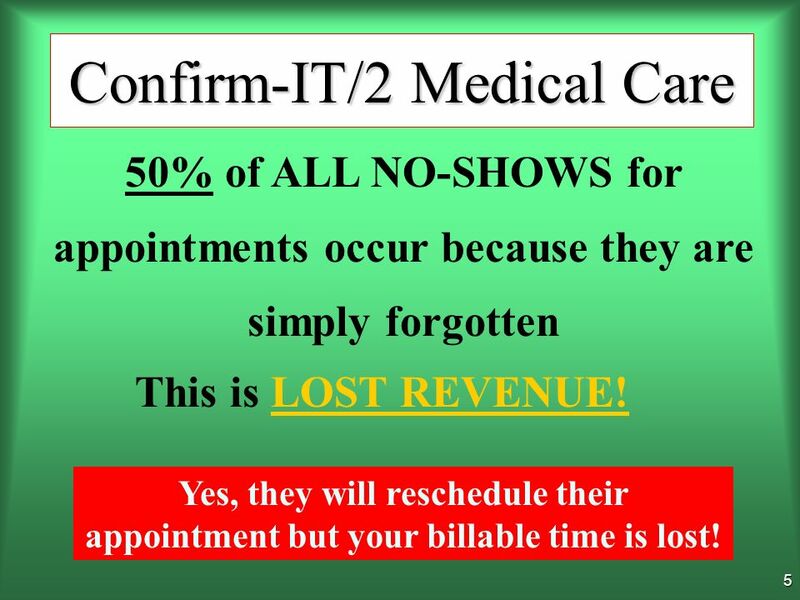 6 5 50% of ALL NO-SHOWS for appointments occur because they are simply forgotten Confirm-IT/2 Medical Care This is LOST REVENUE! 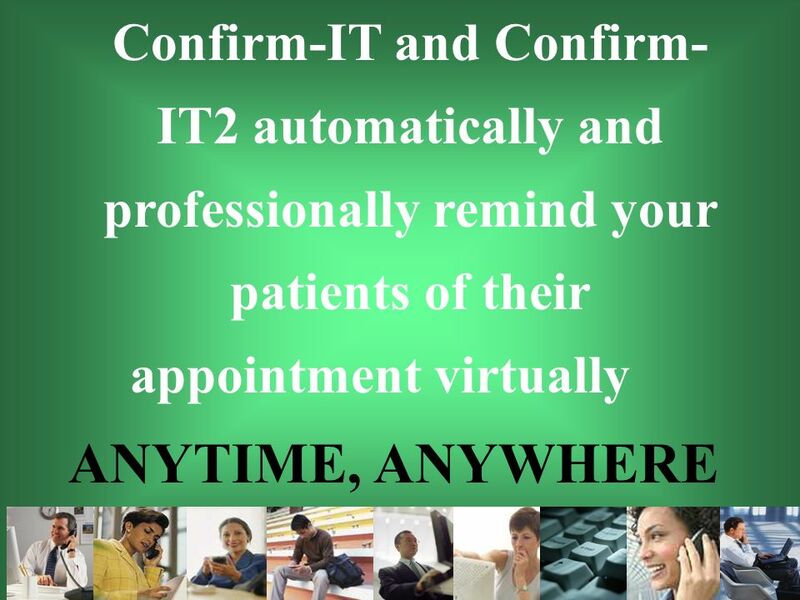 Yes, they will reschedule their appointment but your billable time is lost! 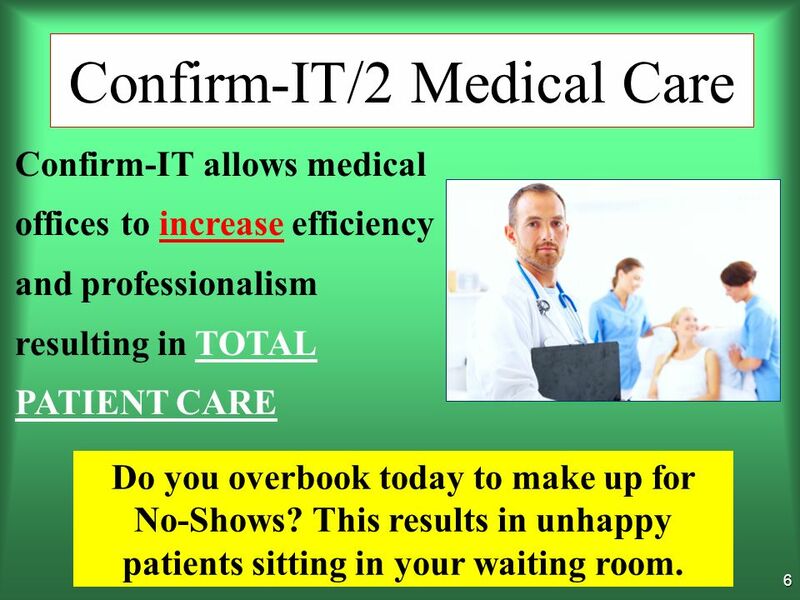 7 6 Confirm-IT allows medical offices to increase efficiency and professionalism resulting in TOTAL PATIENT CARE Confirm-IT/2 Medical Care Do you overbook today to make up for No-Shows? 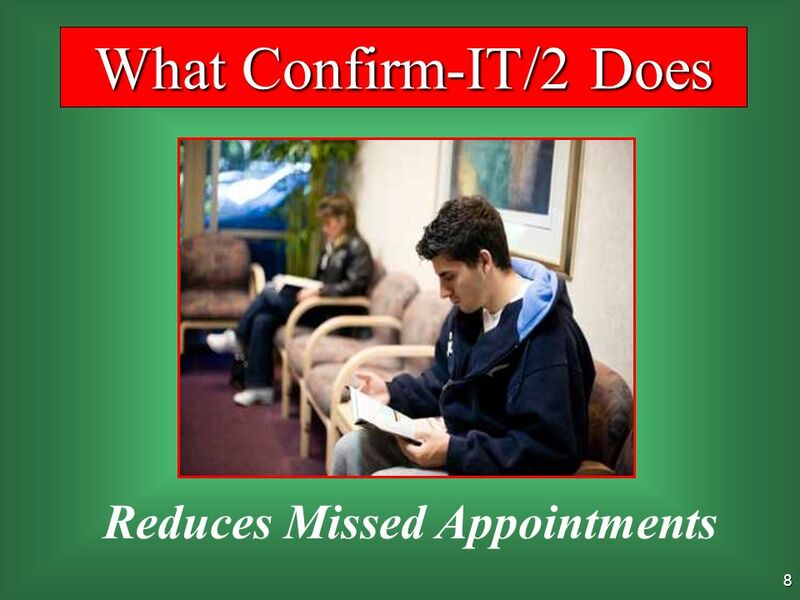 This results in unhappy patients sitting in your waiting room. 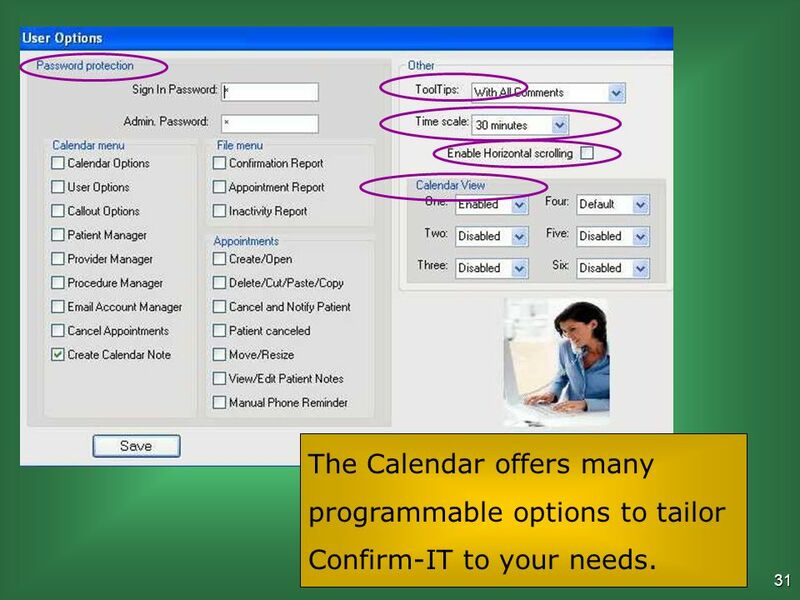 32 31 The Calendar offers many programmable options to tailor Confirm-IT to your needs. 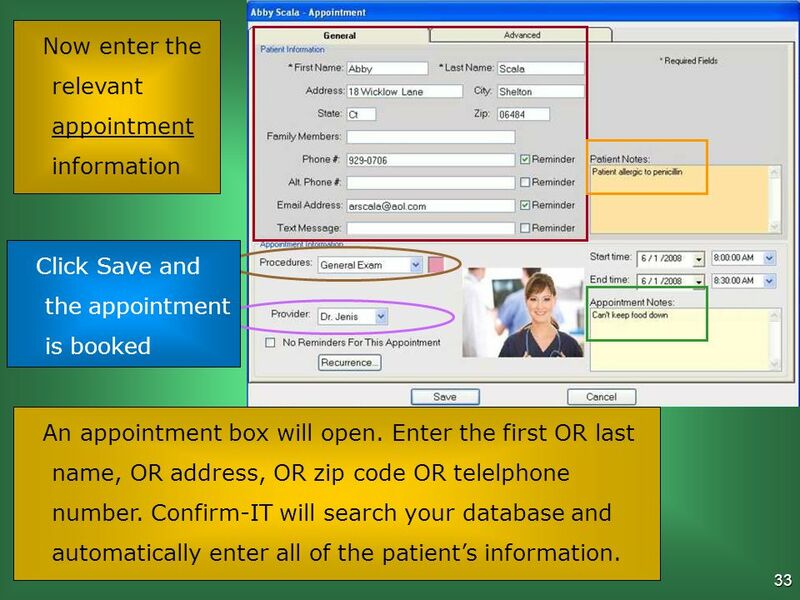 33 32 When a patient calls in, just click on an available appointment under the requested doctor. 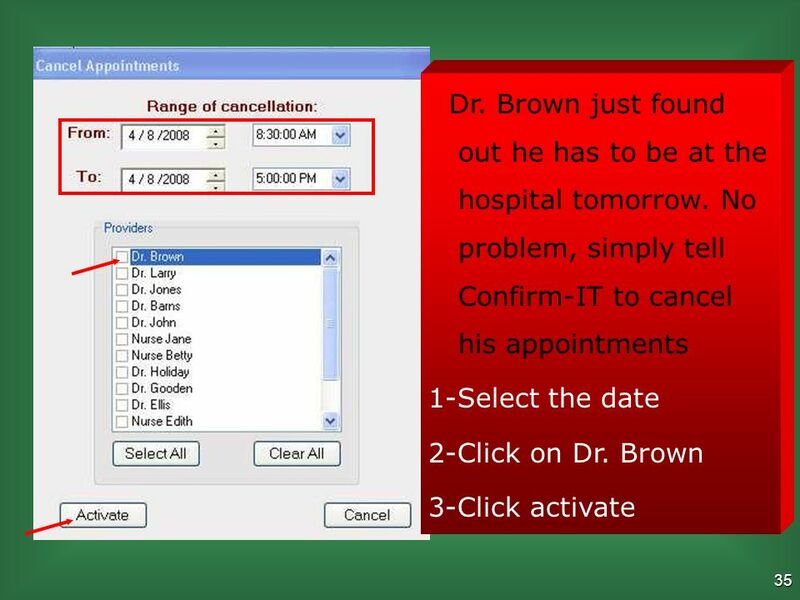 35 34 Click on the Advanced Tab to view additional patient features. 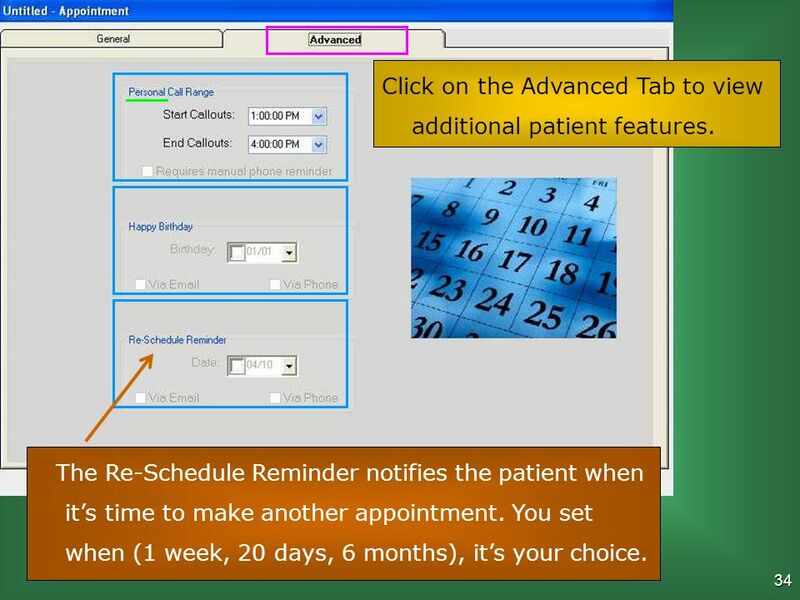 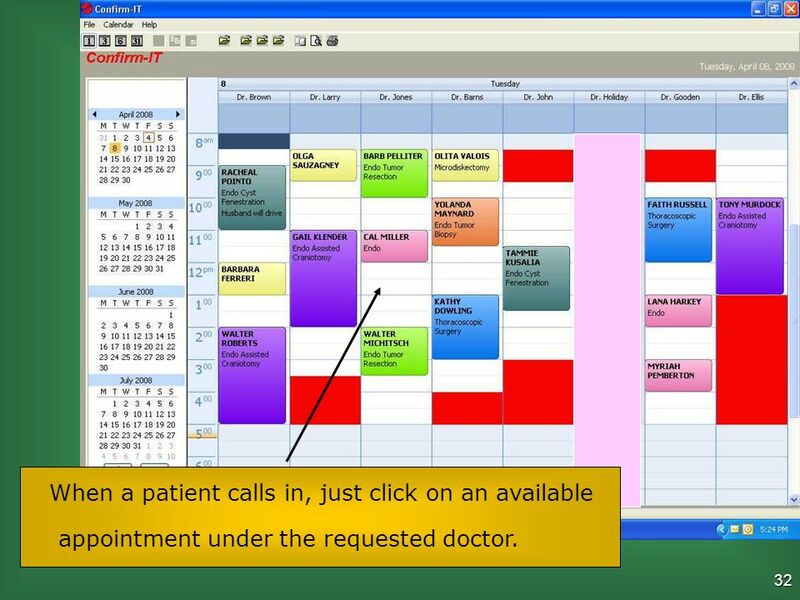 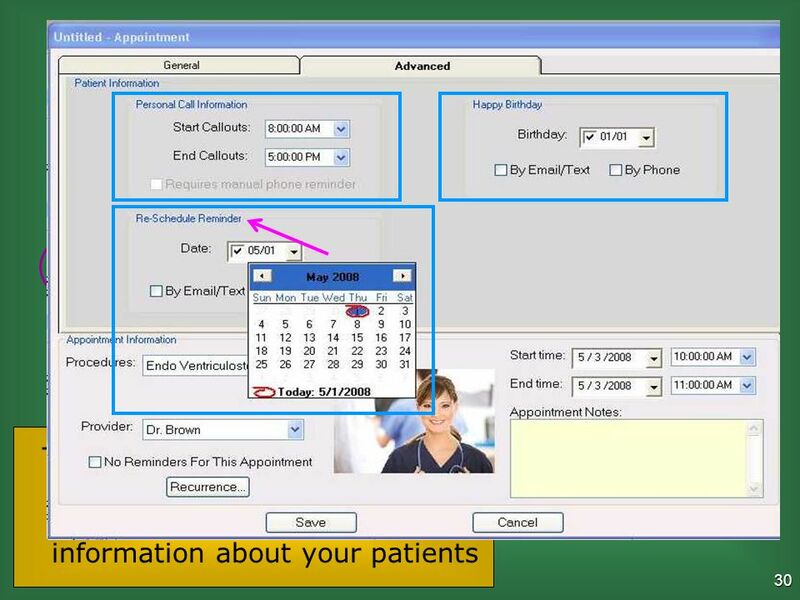 The Re-Schedule Reminder notifies the patient when its time to make another appointment. 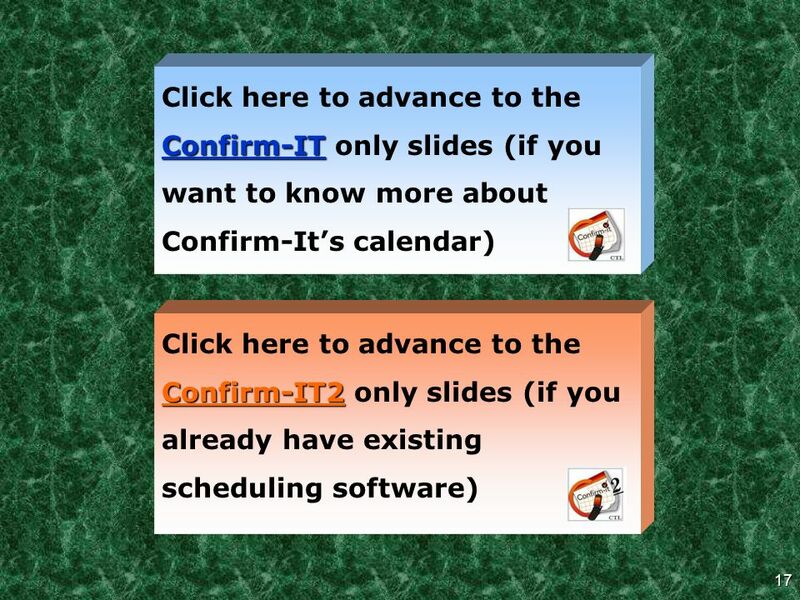 You set when (1 week, 20 days, 6 months), its your choice. 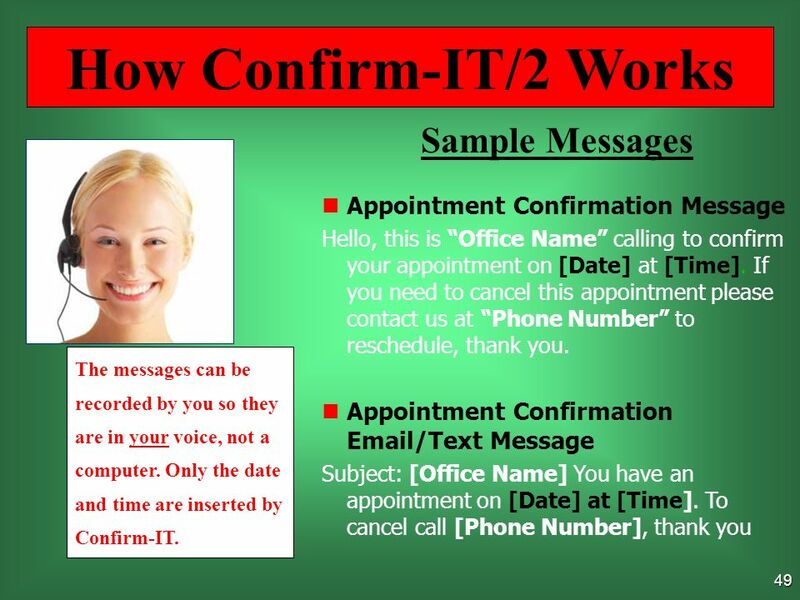 50 49 Sample Messages Appointment Confirmation Message Hello, this is Office Name calling to confirm your appointment on [Date] at [Time]. 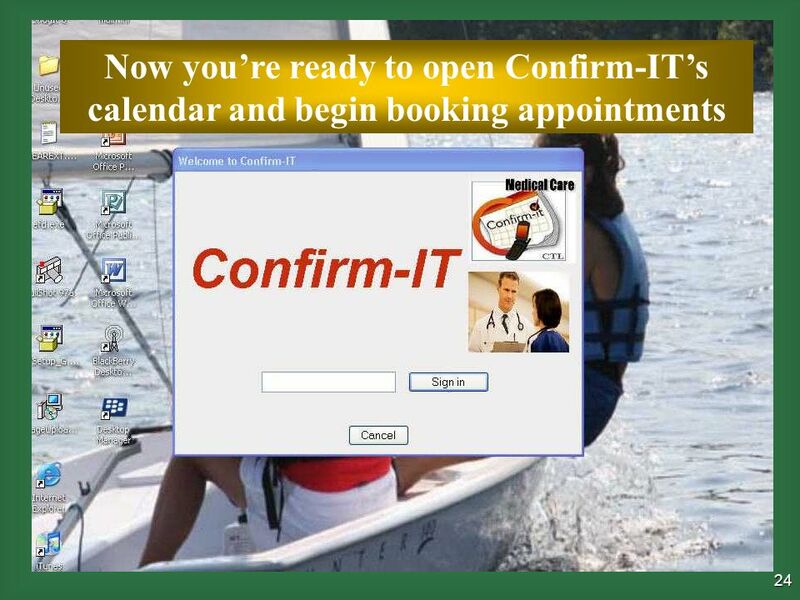 If you need to cancel this appointment please contact us at Phone Number to reschedule, thank you. 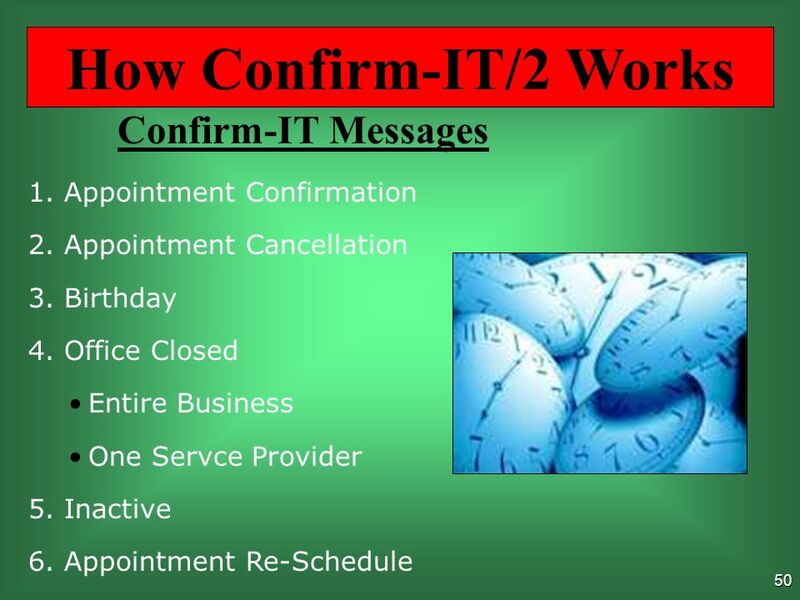 Appointment Confirmation Email/Text Message Subject: [Office Name] You have an appointment on [Date] at [Time]. 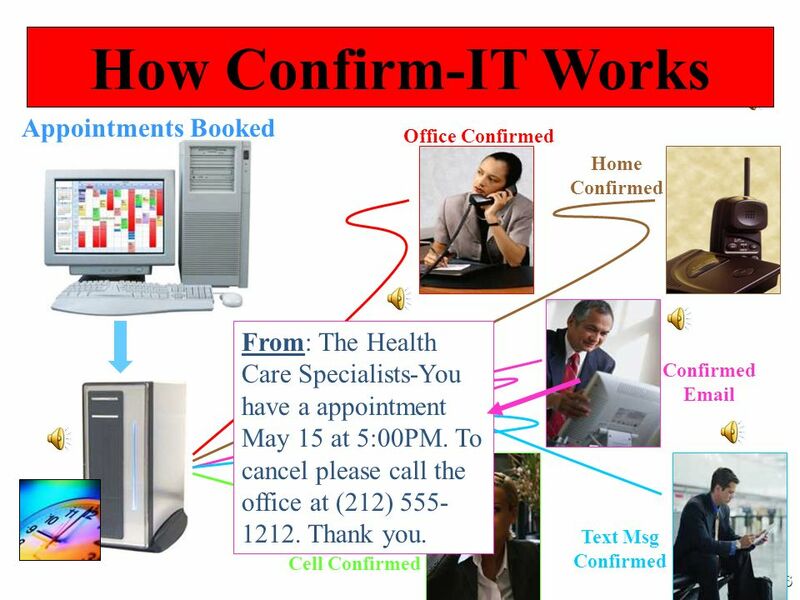 To cancel call [Phone Number], thank you How Confirm-IT/2 Works The messages can be recorded by you so they are in your voice, not a computer. 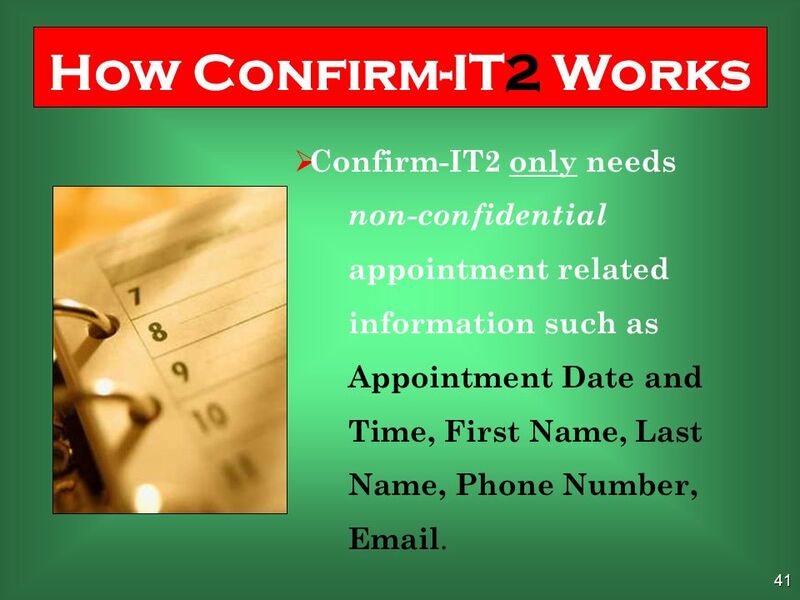 Only the date and time are inserted by Confirm-IT. 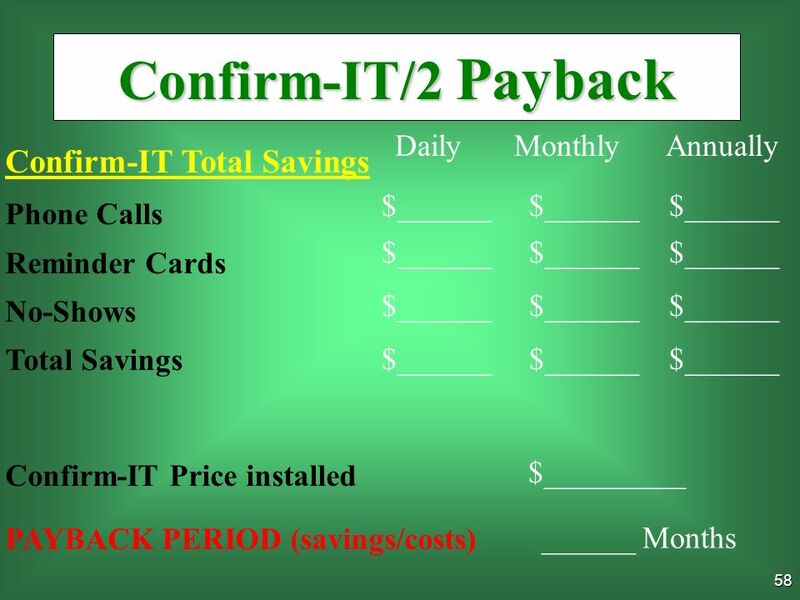 53 52 Confirm-IT/2 Payback OK, LETS ASSUME…… 1. 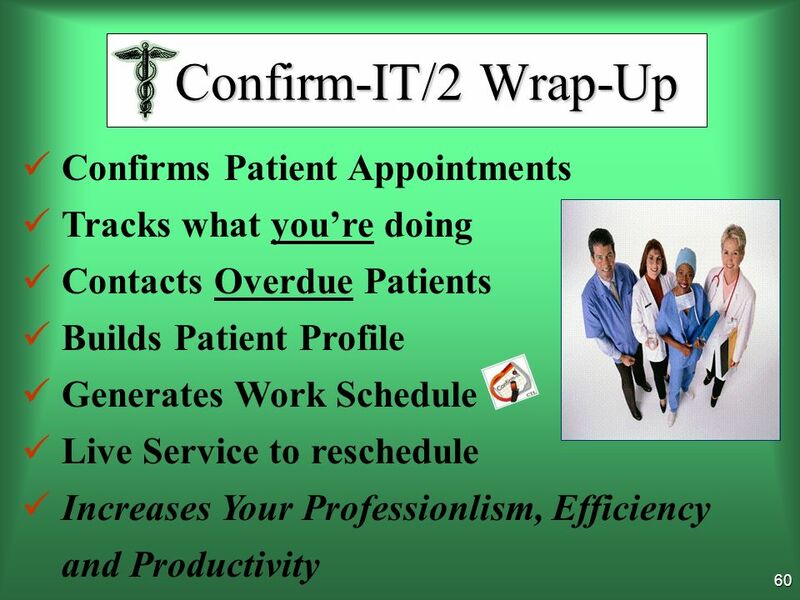 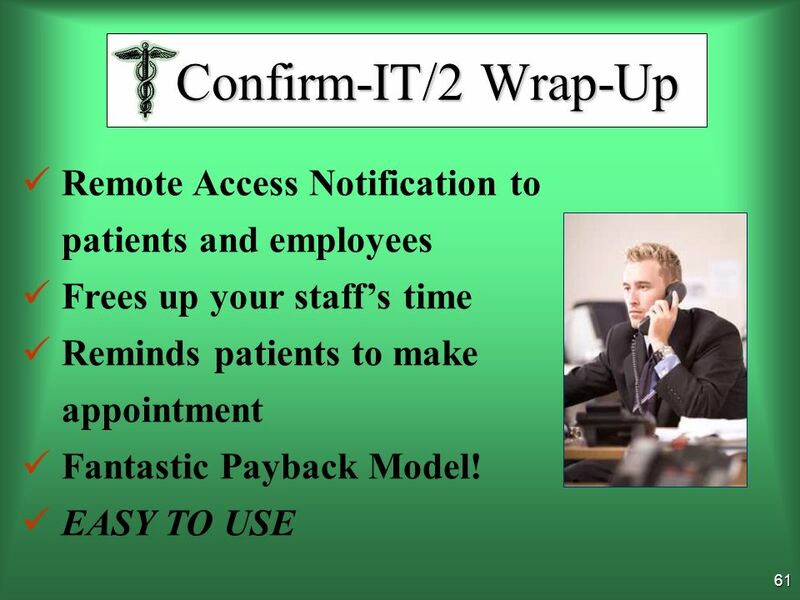 CI avoids just 2 missed Appointments/week 2. 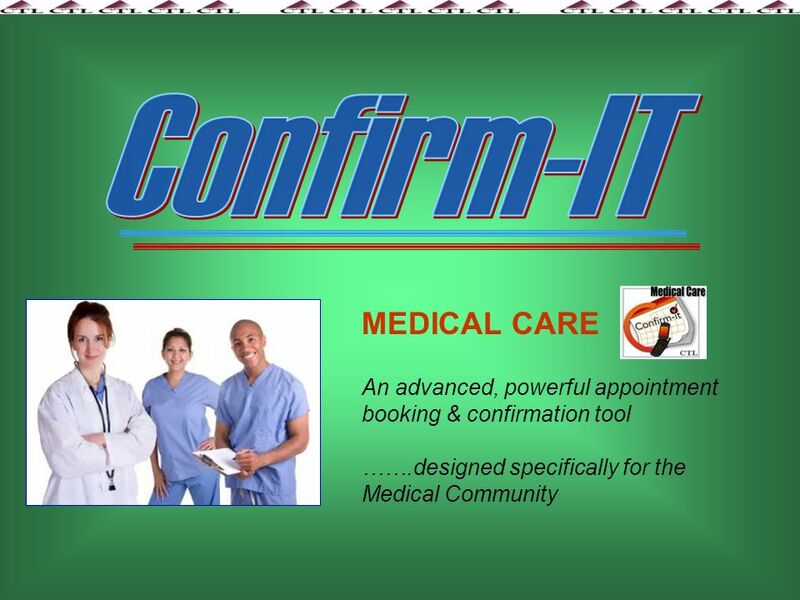 Each Appt is for just $ 100.00 in charges 4. 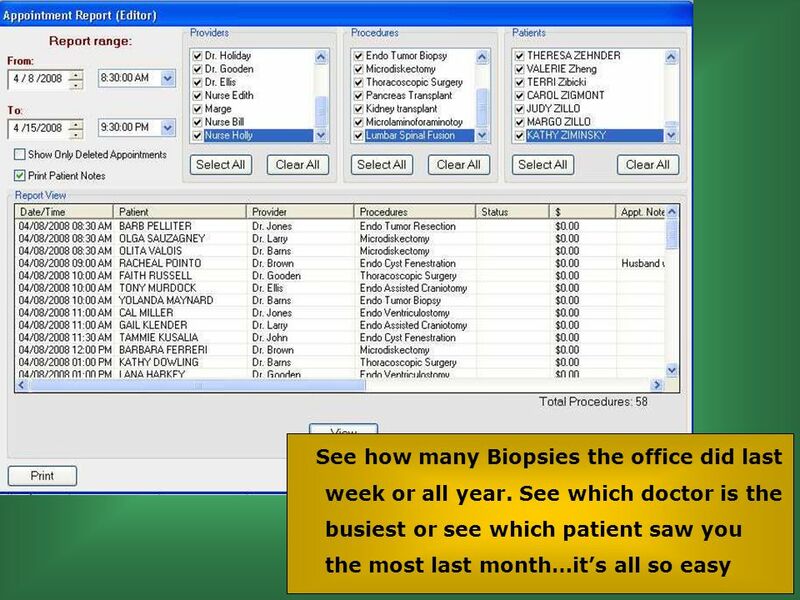 52 weeks/year $ 200.00 3. 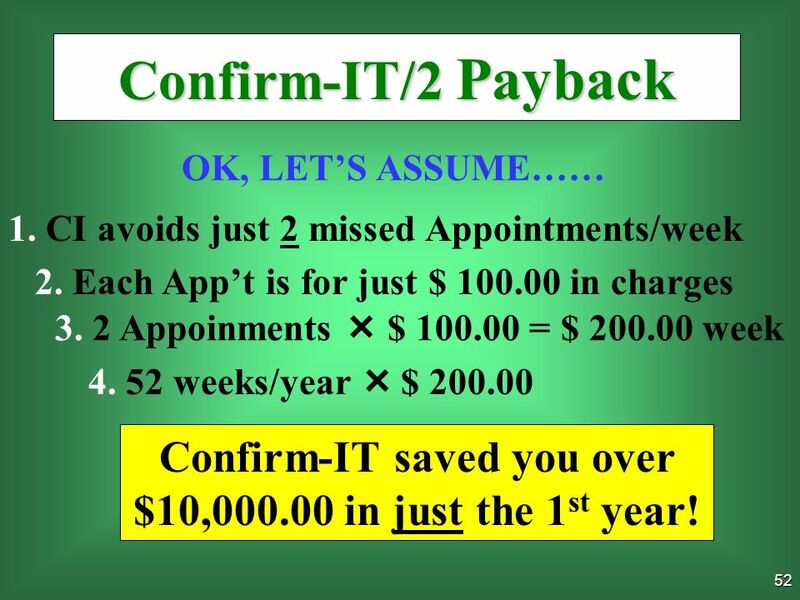 2 Appoinments $ 100.00 = $ 200.00 week Confirm-IT saved you over $10,000.00 in just the 1 st year! 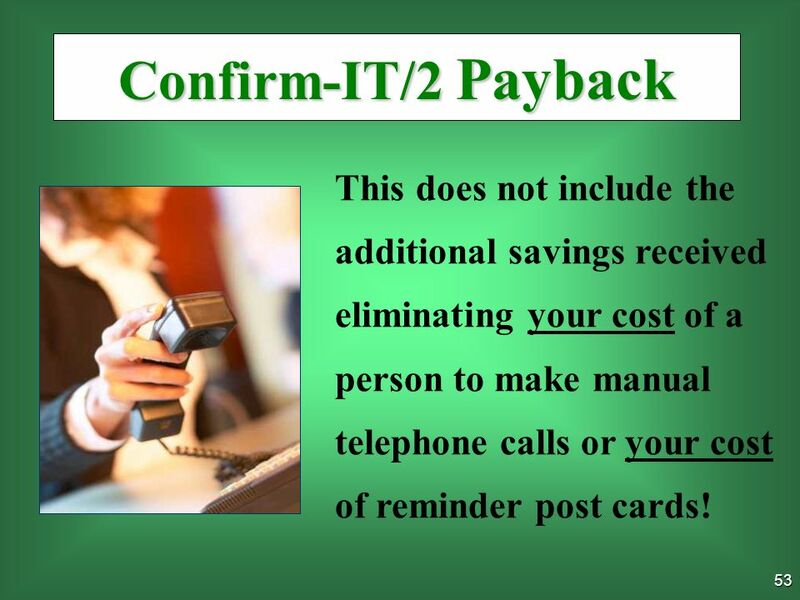 54 53 Confirm-IT/2 Payback This does not include the additional savings received eliminating your cost of a person to make manual telephone calls or your cost of reminder post cards! 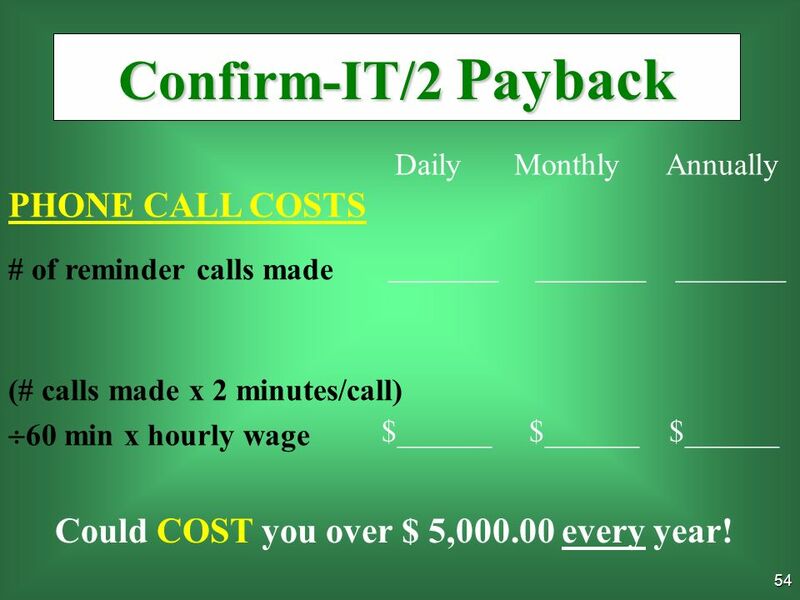 55 54 PHONE CALL COSTS # of reminder calls made (# calls made x 2 minutes/call) 60 min x hourly wage Daily Monthly Annually _______ $______ Confirm-IT/2 Payback Could COST you over $ 5,000.00 every year! 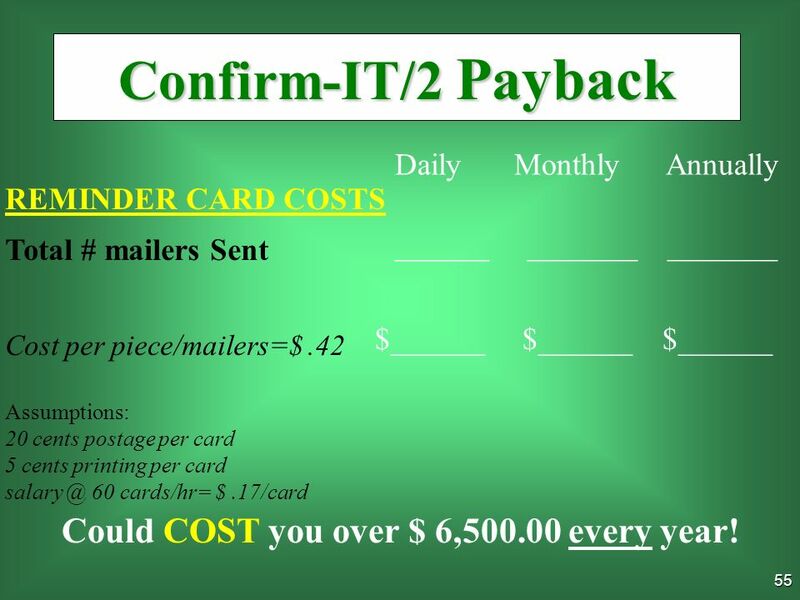 56 55 REMINDER CARD COSTS Total # mailers Sent Cost per piece/mailers=$.42 Assumptions: 20 cents postage per card 5 cents printing per card salary @ 60 cards/hr= $.17/card Daily Monthly Annually ______ _______ $______ Confirm-IT/2 Payback Could COST you over $ 6,500.00 every year! 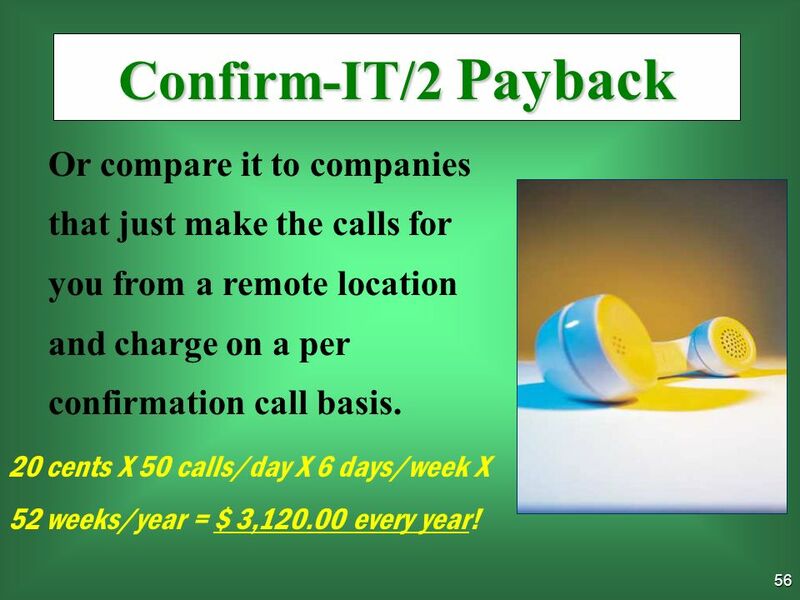 57 56 Confirm-IT/2 Payback Or compare it to companies that just make the calls for you from a remote location and charge on a per confirmation call basis. 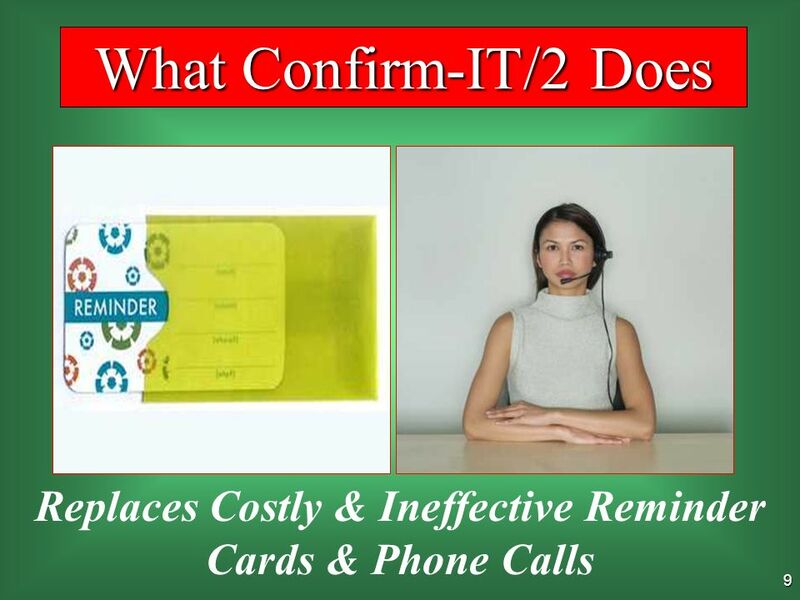 20 cents X 50 calls/day X 6 days/week X 52 weeks/year = $ 3,120.00 every year! 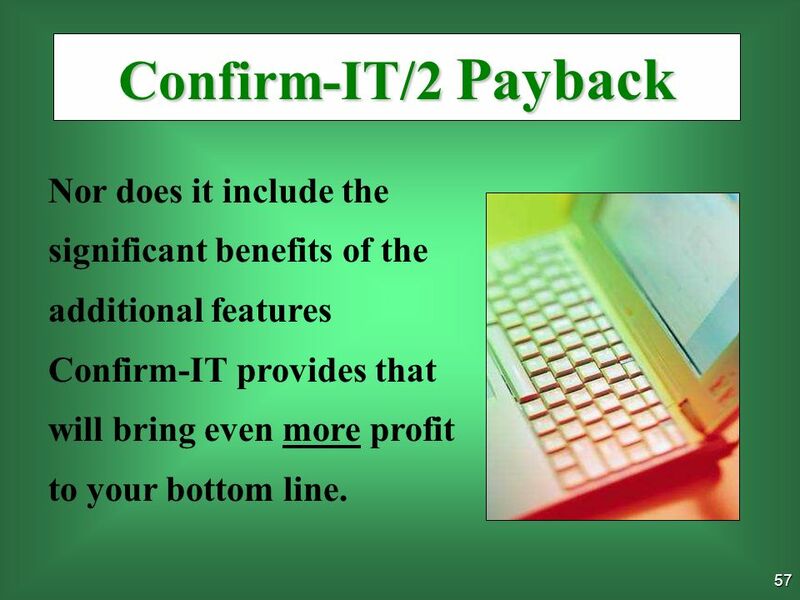 58 57 Confirm-IT/2 Payback Nor does it include the significant benefits of the additional features Confirm-IT provides that will bring even more profit to your bottom line. 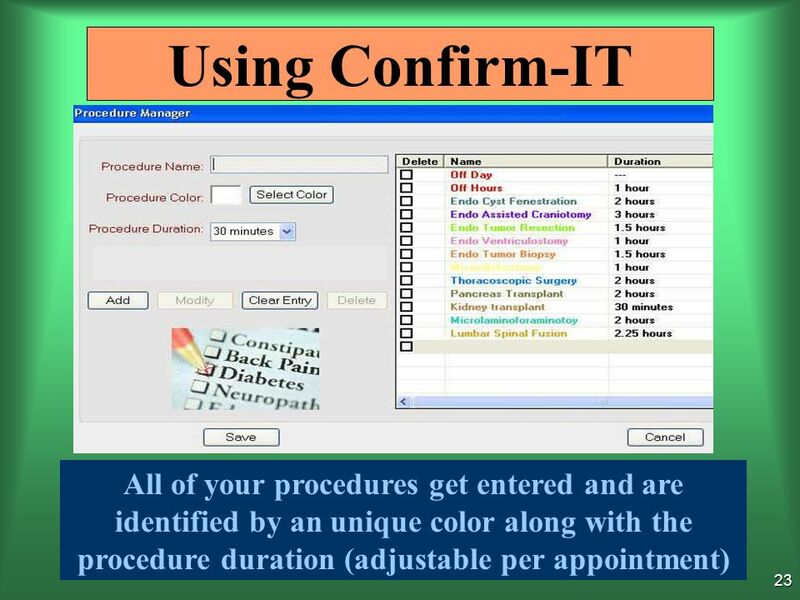 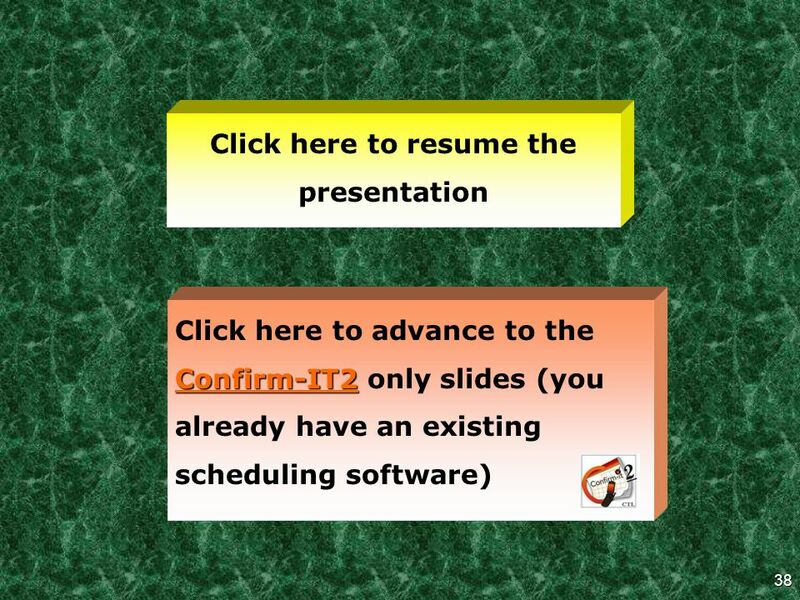 Download ppt "MEDICAL CARE An advanced, powerful appointment booking & confirmation tool …….designed specifically for the Medical Community." 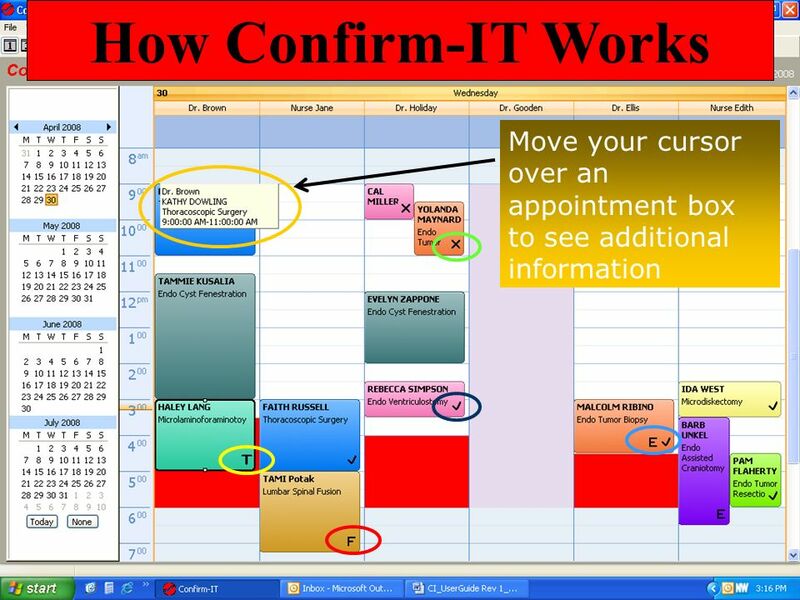 1 An advanced, powerful appointment booking & confirmation tool …….designed to streamline and automate todays business. 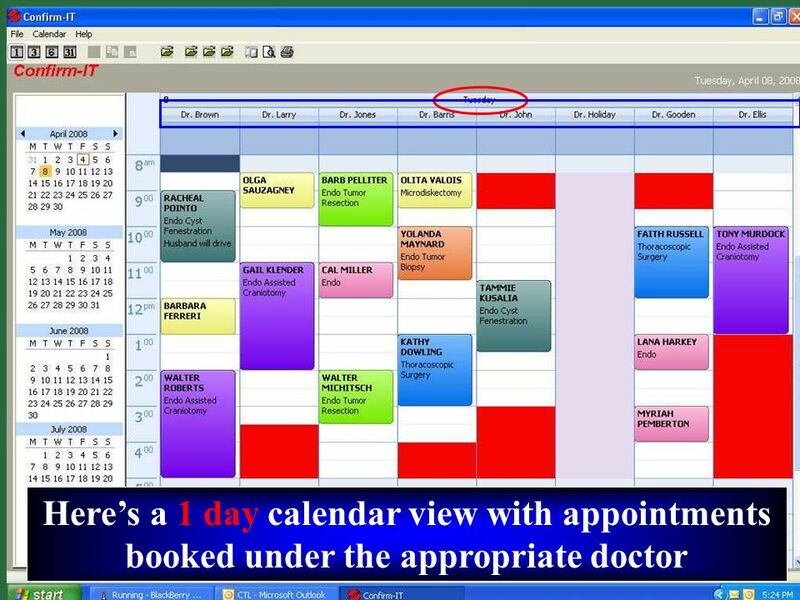 An advanced, NON calendar-based. 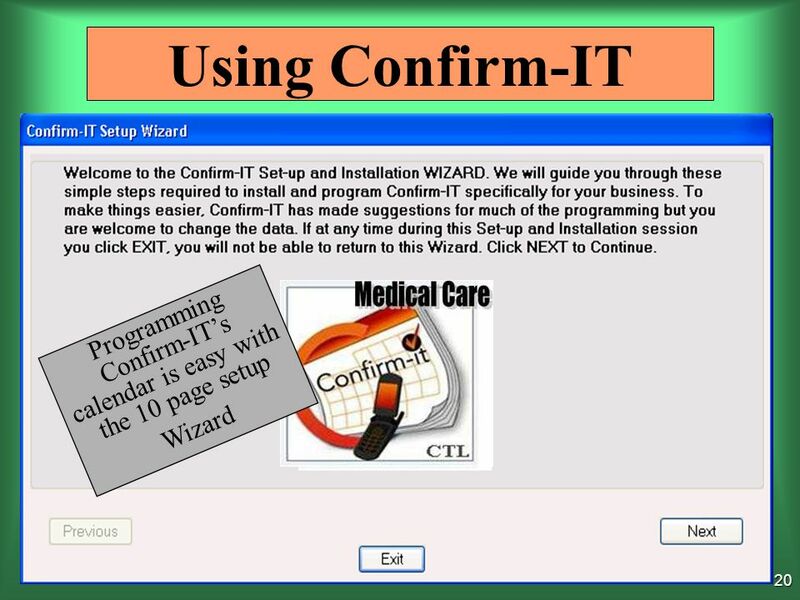 1 WORKING WITH 2007 WORD Part 1 Developed October 2007 with lots of help from. 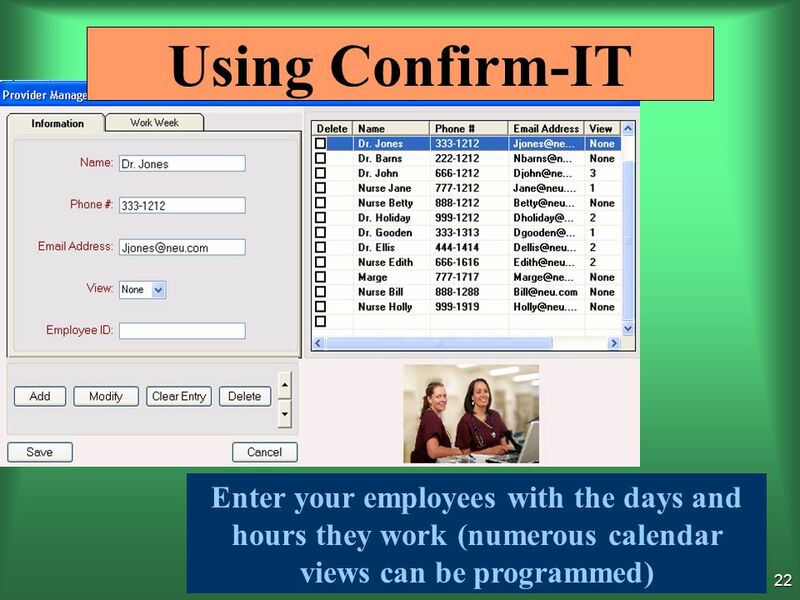 September 2013 ASTM Officers Training Workshop September 2013 ASTM Officers Training Workshop ASTM Member Website Tools September 2013 ASTM Officers Training.